January 12, 2018 By Leroy Thompson & filed under All Articles, Rifles & Carbines, Weapons. One advantage of DRD Tactical Kivaari is it allows fast repeat shots without having to change shooting position to operate the bolt. Some months ago, I covered the DRD Tactical 7.62x51mm Takedown Tactical Rifle. I hadn’t planned to revisit DRD’s rifles this soon, but I’m writing a book on .338 Lapua sniping rifles and was so intrigued by DRD’s Kivaari, which is not only a takedown .338 Lapua Magnum (LM) sniping rifle but also a self-loading one, that I felt compelled to evaluate it. DRD Tactical works closely with military and law enforcement special units to address their needs for easily transported tactical weapons. The Kivaari offers a long-range overwatch/support weapon that is very portable. As an outstanding long-range anti-personnel weapon and a make-do anti-materiel weapon, the .338 LM sniping rifle has become standard with many of the world’s special ops units. These units need a weapon that can be carried into the AO (Area of Operations) and crawled or climbed into the hide. This results in a tradeoff between long-range effectiveness and portability. For maximum effective range, .338 LM rifles normally have relatively long barrels: 27 inches is fairly common. Using a shorter barrel, such as 20 inches, and a folding stock shortens the rifle, but also cuts hundreds of meters of engagement distance. Kivaari’s QD handguard and barrel. The Kivaari offers a different solution by allowing the rifle to take down into three primary components: receiver and stock with scope mounted, barrel, and QD handguard. Barrel length is a compromise at 24 inches, keeping the rifle more readily stowed and handier, but still allowing long-range precision shooting when assembled. Especially noteworthy is that, unlike other .338 LM sniping rifles, the Kivaari is a self-loader, using an AR-type direct-impingement gas system. This allows faster, smoother follow-up shots when used in the overwatch/support mission and also lessens felt recoil. Let me qualify that statement. Skilled snipers can operate their bolt-actions quickly and smoothly; the Kivaari just makes it easier. As it is not necessary to operate the bolt, it is possible to use the Kivaari in a hide where any movement might disturb surrounding camouflage, though at the likely engagement distances with the Kivaari, this would not be a real issue. Kivaari fits nicely into its hard case, but care must be taken in choosing a scope. The Kivaari’s hard case is well designed to carry the disassembled rifle, a bipod, and two spare magazines. There is also a space for a suppressor. I will note a couple of issues, though: Choice of scope and mount is dictated by the cutout for the receiver/mount/scope combo. With care, a powerful variable-power scope, as is normally preferable with a .338 LM, may be used. The QD handguard does not fit in the case with the bipod mounted, so choice of bipod and adapter (if needed) to attach to a 1913 rail are important. IOR Valdada fixed-power 16×42 scope allows assembly of rifle and fits in the hard case. It is an effective long-range scope, with typical Valdada quality. I addressed these two concerns without real difficulty. I chose the IOR Valdada 16×42 Tactical Mil/Mil SF scope with MP-8 reticle because of its 42mm objective lens. I found that a larger objective not only made it more difficult to get the receiver with scope into the hard case, but without a high mount, it made sliding the QD handguard into place impossible. I had a Harris HBRMS compact bipod so used it with the MIM RotoPod adapter. It took some pushing, but it will fit in the case. Assembly of the Kivaari takes a bit longer than other DRD Tactical rifles I’ve tested. The process remains the same: lock back the bolt, slide the barrel into position and use the collar to tighten down the barrel to the receiver, slide the QD handguard into place and lock it, load a magazine, and prepare to shoot. Kivaari assembled and ready for a shot. But the Kivaari requires some added steps. A thread protector must be removed before affixing the barrel. That was true with the DRD M762 as well. An added step with the Kivaari is tightening the barrel collar with a spanner to assure it is locked in place. Affixing the bipod adds another step. I’ve gotten my time putting the DRD M762 together down to about 1½ minutes. I expect to chop off another 15 seconds or so with practice. As the Kivaari would normally be used from a fixed position for long-range engagement, rapid assembly is not likely to be critical. The Kivaari weighs 14.6 pounds empty with bipod mounted. That’s only a few ounces less than the Accuracy International AWM (L115A3 in British military service). With two loaded magazines and all accessories plus the hard case, weight is about 50 pounds. Use of the backpack to eliminate some weight will be desirable for military snipers and some police tactical officers. DRD stipulates that the Kivaari will shoot one MOA with Lapua ammunition. That is good accuracy with a self-loader, but not the precision of many bolt-action .338 LM rifles. With the AWM, Sako TRG 42, and Steyr SSG 08, I have shot one-half MOA groups out to 500 yards. Better shooters could improve on that. During my zeroing and shooting tests, I found that one MOA was about right. At 200 yards, I was getting five-shot groups around two inches. I think that getting 1.5 MOA with this rifle is likely. That is good accuracy, but limits the Kivaari to some extent past 1,000 yards. The Kivaari’s accuracy is aided by its Geissele two-stage trigger. A self-loading .338 LM rifle will be most useful for fire support/overwatch rather than precise engagement of a single target at extreme range. The longest recorded .338 LM sniper kill was at 2,707 yards in Afghanistan using an L115A3. That distance obviously requires extreme accuracy and extreme skill (and a bit of luck), but few shots will be attempted at that distance. Receiver/stock unit with scope mounted. Note clearance necessary below objective to assemble the rifle. Cocking handle, bolt release, and safety are all visible, as is Magpul PRS stock. Overall, the Kivaari is a delight to shoot. I’ve fired 85 rounds in two sessions through the Kivaari. Recoil seems light for a .338 LM. I attribute this to the semi-auto action combined with the Magpul PRS stock, which allows precise adjustment to fit the shooter. As the scope mount needed for the objective to clear the rails might be higher than normally used on a precision rifle, the ability to adjust the cheek piece will be useful. Note that it may be necessary to return the cheek piece to the down position to fit the rifle back in the case. Many .338 LM shooters reload because of the high cost of ammunition—usually at least $3-$4 per round. For those who do reload, I’m happy to report that the Kivaari consistently throws its brass slightly forward and relatively close. Based on taking the Kivaari apart and reassembling it between groups, it holds zero quite well at 200 yards. I have not yet tried it at longer ranges. I fired the Kivaari with Cor®Bon, Black Hills, and Lapua ammunition. It functioned the action reliably with all of them. The controls are easily operated, with one exception. I found that to use the bolt release to lock back the bolt took some effort, and this is necessary before assembling or disassembling the rifle. On the positive side, the release is easy to operate when releasing the bolt, though I normally do that by pulling back the cocking handle. Right side of Kivaari shows ambidextrous controls and locking lever for QD handguard. Operating the cocking handle is smooth and does take some arm strength, but not an excessive amount. Though the action is of the AR type, the cocking handle is non-reciprocating and mounted on the left side, as with the FN FAL. The safety lever is ambidextrous and easily manipulated. An ambidextrous mag release allows the ten-round magazine to be changed without altering shooting position, though it may be necessary to tilt the rifle to the side on the bipod. Noteworthy, too, is that the magazines are easily loaded without a loader. I have been impressed with every DRD rifle I have tested, and the Kivaari is no exception. By combining the ability to disassemble and quickly reassemble the rifle with the self-loading action, DRD has made the Kivaari a more versatile support/overwatch rifle than the standard .338 LM bolt gun. Although the .338 LM is normally considered an anti-personnel rather than anti-materiel rifle, the .338 LM cartridge can be effective against personnel behind many types of cover and can also be used to destroy sensitive electronic equipment or against soft-skinned vehicles. Quick semi-auto repeat shots enhance its effectiveness. 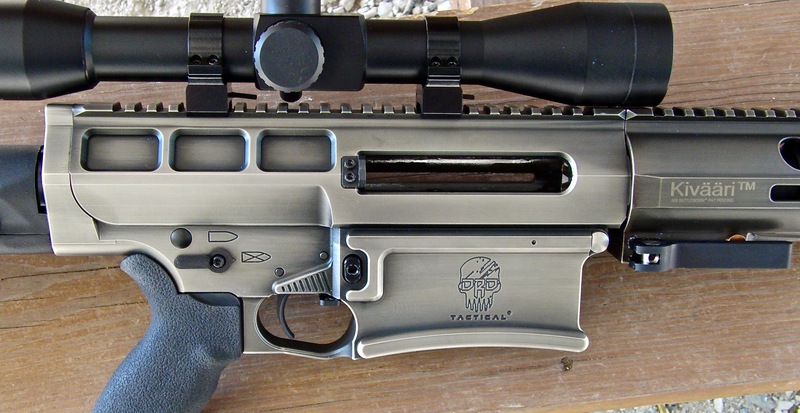 This is a very versatile tactical rifle. 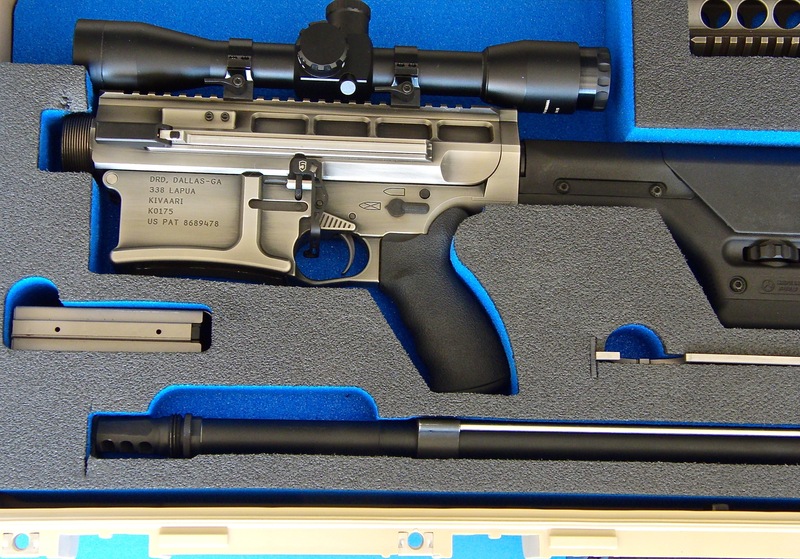 As .338 LM rifles go, the DRD Kivaari is reasonably priced, with an MSRP of $5,000. I'D ALSO LIKE THE FREE PERSONAL DEFENSE NETWORK E-NEWSLETTER, WITH DEFENSIVE TRAINING INFORMATION, DRILLS, AND ANNOUNCEMENTS.